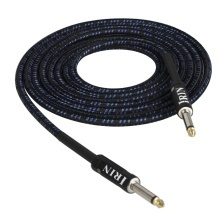 High-quality musical instrument audio cable, 3 Meters/ 10 Feet long. 1/4 inch (6.35mm) to 1/4 inch (6.35mm) nickel plated TS straight plugs. Oxygen Free Copper (OFC) core of conductor and shielding material enhance signal transmission. Colorful tweed woven jacket with 6.4mm outer diameter, very durable and special. Suitable for connecting your electric guitar, bass or keyboard to amplifier.